Intramuros is a very well known international design magazine since the 1980’s which was created and directed by Chantal Hamaide. Buy a single copy or subscription to Intramuros magazine. It is very famous among the male readers of the society who like to keep track of the latest trends happening in the designing world. Mostly used by the corporate sector, this glossy paged magazine consists of the latest architecture and fashion designs. Mostly, the top brands and designers use it for advertising their work of art. Most of the readers of this magazine generally fall under the 18 - 49 years old category. 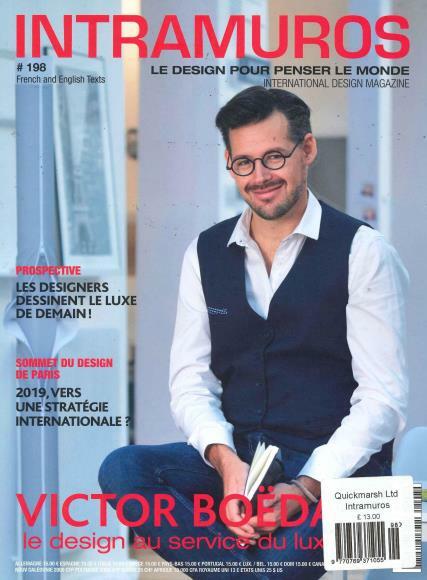 The magazine holds the number one position on French and international design world. If you are looking for the latest trends in furniture, urban designing to interior designs, fashion and the updated new technology, you should grab hold of the latest issue.